Lamps are an important part of Indian culture and tradition and is a revered object at homes and temples. It is called deepam in the south and diya in the north. It is a part of ritualistic worship at temples and homes.Lamps across India are found made of clay,terracotta,porcelain,brass,bronze,silver etc.The earthen lamp is the commonest lamp made on the potter’s wheel from clay. The potter introduced variety in lamp-making and thus we have dome shaped lamp holders and bunch of five diyas. Diyas on top of a elephant figure or a horse figure or as a hanging lamp are also available.Sometimes dances in India are centred around lamps. Earthen diya with five wicks. Metal lamps are found at Hindu temples. Brass, bronze and silver are common. South India and Gujarat have their own array of lamps. Many temples have niches in the walls where lamps are placed. 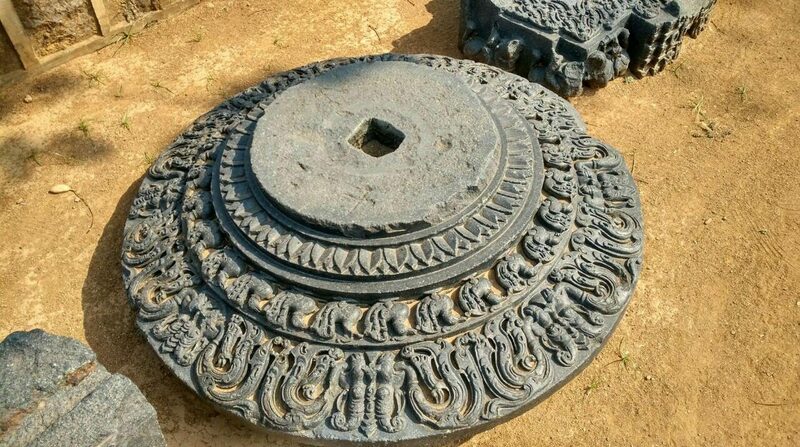 A lamp pillar or deepasthambham has plates at equal intervals and holds the oil and wicks. The plates get smaller and the top of the pillar is decorated with a lion or peacock on top. Lamp used at the time of prayer is called aarti deepa which comes with a handle. The lamp is a symbol of Goddess Lakshmi and is known as deepalakshmi. Lamp as deepalakshmi, South India. Lamps arranged in niches,Thiruvegappura temple Palakkad, Kerala. Deepavali or Diwali means a row or array of lights and symbolises chasing away darkness from one’s life and ushering in prosperity and abundance. The festival commemorates the return of Lord Rama to Ayodhya after defeating Ravana. The whole town of Ayodhya was lit up with lamps to welcome Lord Rama along with his wife Sita and brother Lakshmana. In Tamil Nadu a lamp is called Vilakku and in Kerala it is called Valakku. There is a lot of variety in the lamps of South India. Kuthuvilakku and Nilavilakku are traditional oil lamps used in both Kerala and Tamil Nadu. Many times, a human figure is shown holding a lamp, the cup being the oil container. In the Padmanabha temple at Thiruvananthapuram the male is shown as the figure in the statues, which are mostly brass lamps. There are many inscriptions recording the gift of lamps to presiding deities. The idea of statue lamps was probably taken from the Romans or Phoenicians as the Tamils had trade links with them. Paavai vilakku (lady with a lamp), Tamil Nadu. Tiered lamp in bronze, 13th-14th century, Kerala. Lamps set around a rangoli ( a decorative design) on Diwali. Lamps with human motifs is more common in South India. However many south Indian lamps are found in the temples of Benaras as per O.C Gangoly. The hamsa lamp or swan lamp is found in South India which has a perpendicular stem which is the pedestal of the lamp and is called deepa-briksha. This is broken into various knobs and the whole is surmounted by a model of a swan or hamsa. The hamsa is a beautiful and auspicious bird and is the vahana or vehicle of Lord Brahma. Lamps have been depicted in many paintings both medieval and modern. Diwali celebrations at Kotah, painting, Rajasthan. Copper alloy lamp with peacock and elephant, 18th century, Maharashtra. Lamp at Padmanabhapura palace,16th century, Kanyakumari,Tamil Nadu. During the month of Kartika(mid-November to mid-December) in the Hindu calendar a festival of lights called Karthikai Deepam is celebrated in Tamil Nadu.The lamps are lit when the moon is in conjunction with the Kartigai(Pleiades) and is a full moon. This constellation is a group of six stars in the shape of an ear ornament. This day is called as Kartik Poornima and observed by Hindus across India with lighting of lamps. It is also known as Dev Deepavali and is celebrated in Benaras or Varanasi by lighting of all the ghats on the river Ganges. It is believed that the Gods descend on earth on this auspicious day, to bathe in the Ganga river. Devotees take a dip in the river and offer lamps to the Goddess Ganga in the evening and perform Ganga aarti. Nilavilakku lit up for Karthikai deepam, Tamil Nadu. Image of chromolithograph ‘Indian woman floating lamps on the Ganges’ by William Simpson,1867. Ganga aarti at Varanasi, Uttar Pradesh. Lamp with swan motif, Kerala. Gangoly, O. C/The Journal of Indian art, 1916: South Indian lamps, p 129-136. This entry was posted in deepavali, diwali, hinduism, lamps, Uncategorized and tagged deepavali, diwali, diya, lamps on October 28, 2016 by historyreads.